Red Deer | About Us | Progressive Bearing & Hydraulic Ltd.
Progressive Bearing & Hydraulic Ltd. was incorporated August 1st, 1984 and opened its doors on September 4th, 1984 by Founder and President Don Westrop. Don has spent his working career in the bearing and power transmission business. In 1984, he decided to pursue a life-long dream of owning and operating his own business. 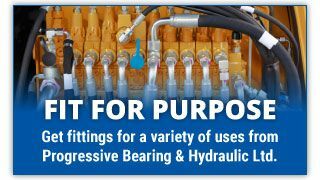 Since then, Progressive Bearing & Hydraulic Ltd. has become a major player in the Central Alberta marketplace. In 1995, Progressive Bearing & Hydraulic Ltd. joined the I.D.I. - Independent Distributors Inc., which is a network of Canadian distributors specializing in industrial supplies, power transmission and bearing products. All of these items are available to our customers. With member locations from coast to coast across Canada, this enables us to quote and service multi-plant national contracts. It is the objective of Progressive Bearing & Hydraulic Ltd. to supply products and services of consistently high quality to meet the expectations and needs of its customers and to ensure compliance with all acceptable codes, standards and regulatory requirements. Our technical expertise and advice are available to our customers at all times.